3 CARS GONE AWAY, SHED LOOKS BARE AS PRE-LOTTERY WORKS GATHER PACE – ONLY THREE TRACKS LEFT! With less than TWO WEEKS to go before operation ceases on 4th September, now is your last chance to take a ride through the old sheds near Banjo Groyne. Cars 4, 6 and 10 are now at the works of Alan Keef Ltd near Ross-on-Wye and restoration is well under way. Staff and VERA volunteers have been busy over the past three weeks taking out the north and south siding tracks and clearing out the shed, ensuring that only ‘clutter’ is put in the skip. The photograph show the west end of the shed and the remains of the sidings. Car 8 looks out from the inspection pit siding perhaps wondering where all the siblings have gone? Car 9, which is the very reliable single ‘toastrack’ car, will be moved into the restoration shed nearby on Friday 2nd September, leaving only cars 7 and 8 to run the last services on Sunday 4th September. Power will be switched off at 5.00pm and will be the start of an intensive two weeks of work to lift the remaining track between Halfway Station and the shed. 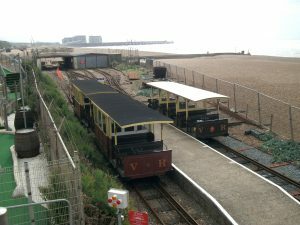 Cars 7 & 8 will be moved into a temporary storage shed on the east side of Banjo Groyne. The construction contractor will take possession of the site at the end of September. This unusual view of Halfway Station and the sheds, with cars 7, 8 and 9 at the platforms will become the norm now that the new Grace’s Café is finished with its delightful rooftop seating area.